Reset Safari for SBSettings is an SBSetting toggle that allows you to quickly clear Safari’s cache, history and remove all tabs. 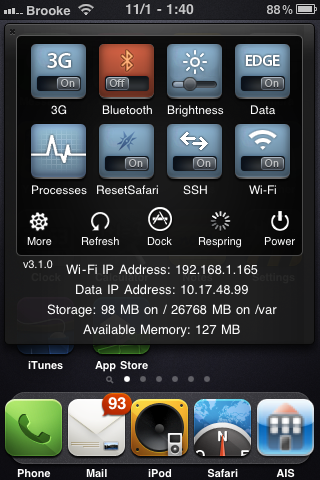 Once the app is installed, you will need to go into SBSettings and then the More option and turn the toggle on. Once it has been set as one of your toggles, it’s pretty simple to use… just tap the ResetSafari toggle and it clears everything. It does not actually toggle on or off… you just tap it and it instantly deletes everything. If you use the toggle while Safari is open, it will close the app in-order to reset it. When I tested the app… it worked just as I expected. All my Safari history and tabs had been removed and my cache cleared. I didn’t catch any glitches with the app… let me know in the comments if you did. You can get Reset Safari for SBSettings via the BigBoss source.